The 6 Best Solo Training Techniques! Think you can't maximize intensity when working out alone? You're wrong. Add these 6 methods to your training arsenal to see optimal results! Intensity is the key to getting serious results on any weight-training program. You know what doesn't help you get results? Excuses like this one: "I train by myself, so I'm not able to lift as hard as if I had a partner." Nonsense. When you're training by yourself, you can hit the weights as intensely as anyone else. Just blast some inspiring music on your iPod and utilize the following intensity-boosting techniques, handpicked specifically for the guy or girl rolling solo in the weight room. Forced reps are typically a two-man technique, where once you reach muscle failure your spotter assists by helping you perform the positive part of the rep. But you can also do forced reps by yourself via unilateral (one-arm or one-leg) training by using dumbbells, cables, or machines. For example, after you reach muscle failure on one-arm dumbbell preacher curls, perform forced reps by assisting your working arm with your non-working arm. You can also use this technique on leg extensions or leg curls by assisting with the non-working leg after reaching failure. Looking to hit your delts hard? They're another muscle group that can benefit from unilateral training with exercises like one-arm Smith machine upright rows. To execute these properly, grab the middle of the bar with one hand, then assist with the opposite arm. Forced reps have been shown to boost growth hormone (GH) levels three times more than ending a set after muscle failure.1 And another study reported that trained athletes using forced reps for 10 weeks lost more body fat than those who stopped after reaching failure.2 Still skeptical? Check out the video above where I touch upon how to effectively fatigue your muscles and spark growth even when you're training solo. On the last set of each exercise, after reaching failure, perform 2-3 forced reps by assisting with the non-working arm. Just one problem for the guy or girl going it alone: Even more so than forced reps, negative-rep training is typically a two-person job. Why? To do it properly, you need to use a weight that's about 120 percent of your one-rep max. So how do you do this without a spotter? Simple: by lifting the weight through the positive portion of each rep with both arms or legs, then lowering it slowly on the negative with only one limb. You can't do this with free weights, but Smith machines and other weight machines work well. To do unilateral negatives on a Smith machine bench press, for example, first figure out how much weight you can press with one arm. Once you've calculated your approximate one-arm, one-rep max, add about 20 percent for your working weight. Grip the bar where you normally would when using two arms (outside shoulder width)—provided the Smith machine is in good shape, it should move smoothly even with your hand way off center. Unlatch the bar with both hands, then remove your left hand and resist the weight down for a 3-5-second negative. When the bar touches your chest, put your left hand back on the bar and press back up as normal. Repeat the one-arm negative with your left arm. Alternate arms every other rep until you've done 5-8 on each side. You can also use unilateral negatives on leg day with compound exercises like machine hack squats or leg presses. You can also use it for isolation moves like lying and seated leg curls and standing calf raises. Check out this video for more instruction on unilateral negative reps.
2-3 minutes rest between sets for the first three exercises. 1-2 minutes rest for the final two exercises. *Perform 3-5 negative reps per arm as described above. Rest-pause is a technique used as a means of performing more reps with a given weight by taking short, 10-20 seconds breaks during a set. For example, if your goal is hypertrophy, after reaching failure, you'd rest 15 seconds and continue to failure again without lightening the load (which you would do in a dropset). For building strength, a good rest-pause technique is to use a weight that normally limits you to 3-5 reps. In between each rep, rest for 10-15 seconds. This should allow you to complete more than the 3-5 reps total. Though it's possible to use either of these methods when training alone, on certain exercises like the squat, leg press, bench press, and barbell overhead press, pushing yourself to such limits could be dangerous. A much safer—and equally effective—option for solo trainers is a method called alternating rest-pause. With this version, you perform exercises that allow you to alternate arms or legs, such as dumbbell shoulder presses and alternating curls. 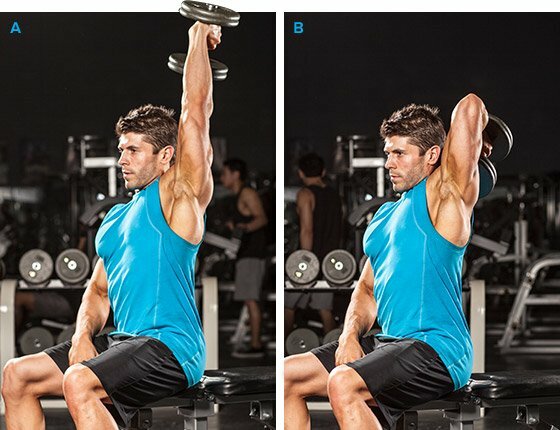 To perform, simply do one rep with one arm, then one rep with the other arm. Continue in this fashion until you reach muscle failure. Because one arm (or leg) is resting while the other is working, you can do far more reps with a given weight than if you did all reps consecutively with one arm. Of course, alternating rest-pauses can be done on machines, too. "Iso-Lateral" Hammer Strength machines—chest presses and rows, for example—are great for alternating rest-pauses because you can rest the weight completely on one side while lifting with the other. Another way to use the alternating rest-pause technique is found in my alternating rest-pause training program. Iso-Lateral” Hammer Strength machines—chest presses and rows, for example—are great for alternating rest-pauses because you can rest the weight completely on one side while lifting with the other. Alternate arms on each rep. Cheating might sound more like an ill-advised shortcut than a way to boost training intensity, but not necessarily. Seasoned gym veterans cheat on many exercises by using a little "body English" to allow for more reps to be completed with a given weight than could be achieved by using strict form exclusively. The difference between a beginner and an advanced lifter cheating is that beginners cheat on every rep, while the latter cheats only after reaching muscle failure with proper form. When you use cheat reps in the advanced manner, it allows you to take a set past muscle failure so that you can place that much more stress on the muscle and instigate greater growth. For example, on triceps pressdowns, after you can no longer perform another rep with strict form—elbows in close to your sides, movement occurring only at the elbows)—loosen your form by letting your elbows flare out to the sides and using your chest and shoulders to help push the weight down to force out a few more reps and take your triceps well past fatigue. Need more tips on form? Watch my video on cheat reps! 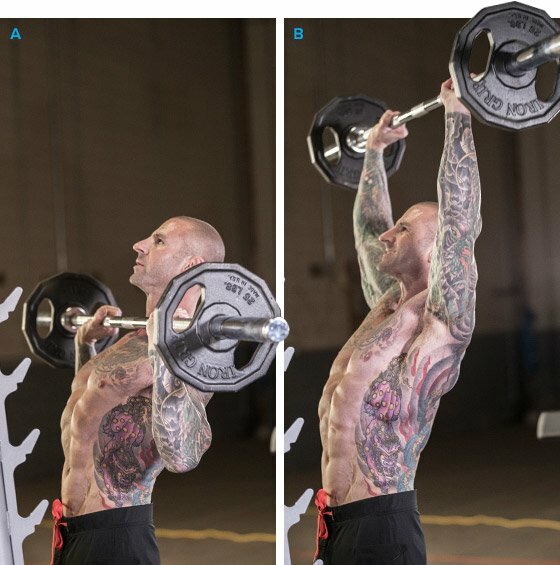 Finish the last 1-2 sets of each exercise with cheat reps.
* After reaching failure, use a close grip and, keeping your arms close to your sides as you lower the weight, immediately rack the bar and take a standard bench-press grip and perform as many reps as possible until reaching failure. ** After reaching failure, perform cheat reps by allowing your shoulders to assist the triceps. It should look more or less like a hybrid of overhead extensions and dumbbell overhead presses. Pre-exhaust is a technique where you perform an isolation exercise, such as dumbbell lateral raises, followed by a multijoint exercise for the same muscle group, like the barbell overhead press. As its name implies, the benefit of pre-exhaust is that it exhausts the target muscle—in this case the middle delts—before the multijoint exercise. That way, when you do overhead presses, you fail when the middle delts are fully fatigued, not when the other assistance muscles like the front delts and triceps fail. The problem with using this technique while training alone is that doing free-weight compound exercises can be dangerous when your target muscles are already exhausted. A safer and even more intense technique is pre-/post-exhaust, which is similar to pre-exhaust except that you follow up the compound exercise (barbell overhead press) with another set of the isolation move (lateral raises). This way, you can safely stop short of failure on presses and still reach total muscle exhaustion by failing on lateral raises to finish the set. This technique is guaranteed to spark new growth in whatever muscle group you train it with. Pre-/post-exhaust works especially well when training the back, since the biceps often tire out long before the lats. Try pairing straight-arm lat pull-downs—an isolation movement—with bent-over or seated cable rows—a multijoint exercise. A word to the wise when training lower body: If doing pre-/post-exhaust for legs for the first time, choose a machine like the hack squat or leg press for your compound exercise instead of a free-weight move since exhausted quads can hamper technique. With dropsets, you perform a set to failure, then immediately reduce the weight and continue the set until reaching muscle failure again. This is one of the easiest ways to take a set past muscle failure when training alone. Since you can no longer go on with the original weight, lightening the load a bit allows you to keep banging out reps. Typically, I recommend dropping the weight by about 20-30 percent, but this recommendation can vary depending on the individual. For example if you're using 150 pounds on the last set of lat pull-downs, a 20-30 percent drop would be 30-45 pounds. Since most pull-down stations adjust by 10-pound increments, you could drop the weight by 30, 40, or 50 pounds to 120, 110, or 100 pounds. Exercises like pull-downs, in which you're using a selectorized weight stack that allows you to drop the weight in a matter of seconds by adjusting a pin, are your best bet when training alone, because it keeps the time between the dropsets minimal. Dumbbell exercises like rows also work great for dropsets when training solo, because you can simply grab the lighter dumbbell to complete the set. With a barbell, you'd have to remove a plate from each side to drop the set, setting yourself up for an unnecessary, time-consuming process. The longer you take between dropsets, the less intense your workout is and the more you start to defeat their purpose. You might normally do one dropset on the last set of each exercise for a muscle group. However, you can kick the intensity up another notch by doing two or even three dropsets on the last set. Those with less training experience should stick with one dropset, while those with more training years under their belt can bump it up to really hammer the muscles. Want to know more? Check out my video on dropsets. 1-2 minutes rest on the first and last exercise. 2-3 minutes on the third and fourth exercise. On the last set of each exercise, do 1-2 dropsets, lightening the load by roughly 20-30 percent each time. Ahtiainen, J. P., Pakarinen, A., Kraemer, W. J., & Häkkinen, K. (2003). Acute hormonal and neuromuscular responses and recovery to forced vs maximum repetitions multiple resistance exercises. International Journal of Sports Medicine, 24(6), 410-418. G E Fincher, I. I. (2003). The effect of high intensity resistance training on body composition among collegiate football players. Medicine & Science in Sports & Exercise, 35(5), S324. Yarrow, J. F., Borsa, P. A., Borst, S. E., Sitren, H. S., Stevens, B. R., & White, L. J. (2007). Neuroendocrine responses to an acute bout of eccentric-enhanced resistance exercise. Medicine and Science in Sports and Exercise, 39(6), 941-947.